It wasn't Bears fans, but rather Deadheads who broke the ticket sales record at Soldier Field Friday night. More than 70,000 tickets were sold to the first of the three shows on the Grateful Dead's "Fare Thee Well" tour stop in Chicago, according to Soldier Field. U2 held the previous record of 67,936 tickets sold for the 360 Tour in 2009. The new record is 70,764 tickets. The show continues Saturday and Sunday nights at Soldier Field. Tickets went on sale in March and sold out within minutes, immediately hitting the secondary market with prices as high as $116,000 for a three-day pass. Prices then dropped drastically on sites like StubHub as the concert dates drew nearer. 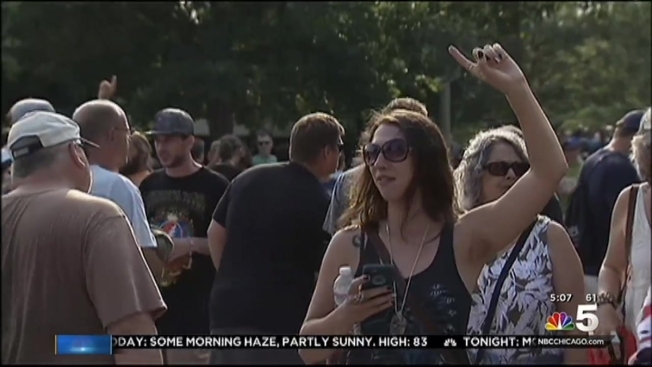 More than 80,000 people are expected to be in the stadium and at the nearby Museum Campus for the Grateful Dead show and the Fourth of July fireworks at Navy Pier. Only people with tickets will be allowed onto Soldier Field grounds. Ticket holders can enter Soldier Field on the north side along McFetridge Drive or on the south side at the sidewalk areas connecting the stadium to the parking lots. Tailgating will be permitted in the parking lots only.